I’ve been writing a series of articles on “add on” programs that can be used to expand the capabilities of your QuickBooks desktop program. 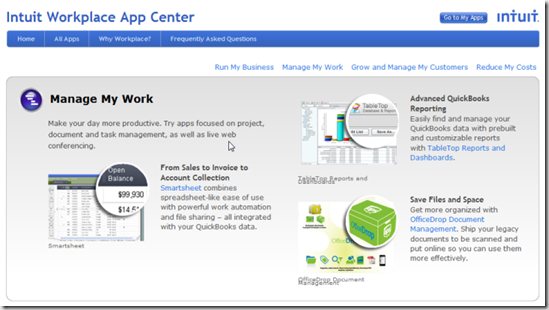 This week I’ll talk about the Intuit Partner Program (IPP) and the Intuit Workplace App Center, Intuit’s new method for delivering “apps” to you that work on the web but work with your desktop data. In my prior articles I’ve talked about the QuickBooks SDK, the IIF method of integration, and using Excel imports. Each of these methods have their advantages and disadvantages. In this article I’m going to focus on how these programs work with your QuickBooks data, and how you can learn more about them. I believe that it is important that you understand how these programs work with your data before you jump in and use them. I’ll review some specific applications in future articles. What is the IPP Interface? 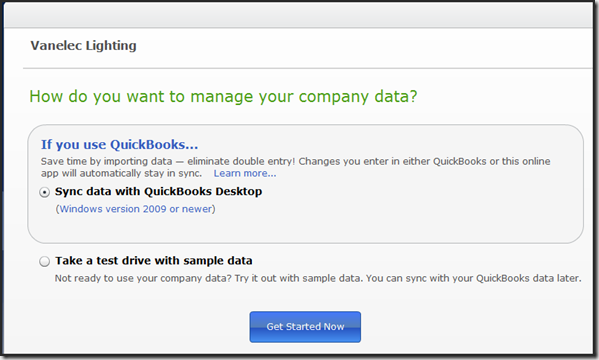 Normally your QuickBooks data is stored in a company file that is located in your desktop computer or on a server on your local network. This is a closed database that you cannot access directly. Until recently, if a program wanted to access this data it would have to go through the QuickBooks SDK. A program using this method will usually run on your computer (web access can be done as well, but is a bit tricky) and exchange messages with QuickBooks through an interface that is complicated to use. In the past year or so Intuit has been trying to push add-on developers to use a new method, the Intuit Partner Platform (IPP). 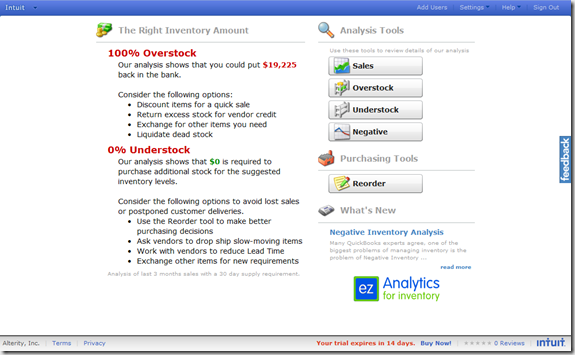 In VERY general terms, Intuit will send a copy of your QuickBooks data to an Intuit server via the Internet. The add-on application will not directly access your local data, it will instead read and update this web or “cloud” based data. Intuit will keep this data in synch with your local data – periodically sending updates from your local data to the web database, and bringing back updates from that web database to your local data. 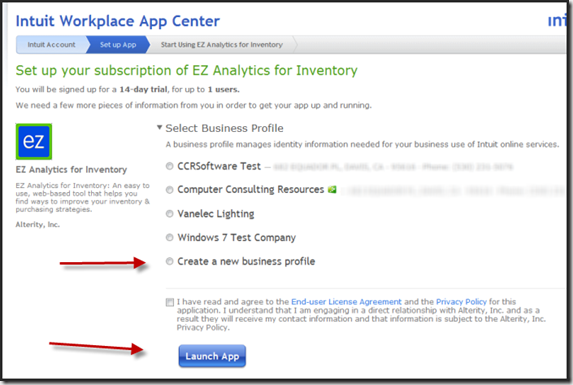 You don’t buy the application and install it – you will be paying a monthly fee to use the program, possibly per user. This is similar to what you see with the Apple iPhone and apps for that. You have to be connected to the Internet to use the application. A copy of your data resides on the Intuit servers. How Do We Get These Add-on Applications? 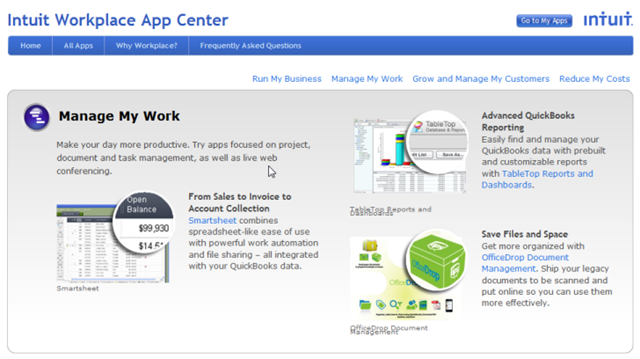 If you are using the 2010 release of QuickBooks you will see an App Center icon on your toolbar. 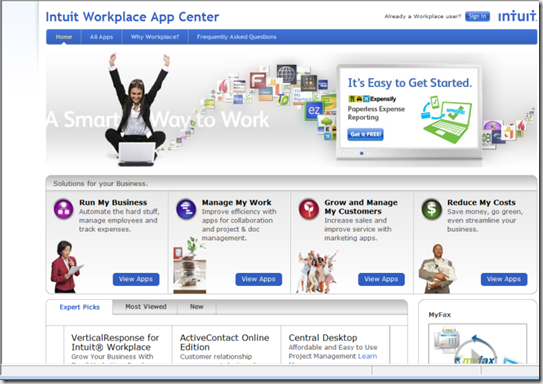 Click on this and you are taking to the Intuit Workplace App Center. 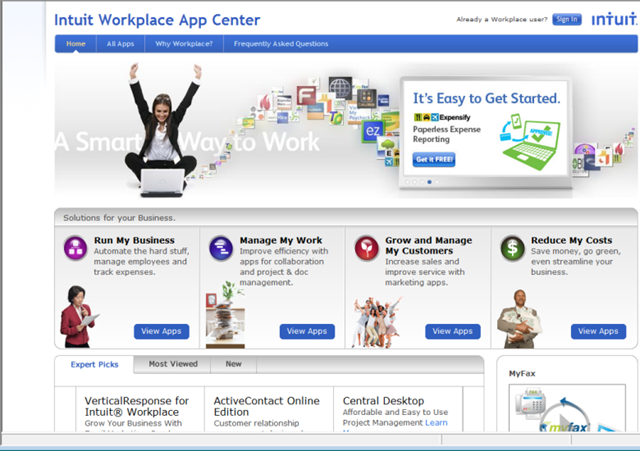 You can also go directly there from this link: http://workplace.intuit.com/appcenter/. The web site has undergone many changes and I’m sure that there will be more in the future. Personally, I find it a bit hard to find what I’m looking for. You can select a category and click on the view apps button. For example, this is the manage my work page. Scroll down and you will see a list of apps – this is a limited list that shows just the most popular, or the newest apps. You can click on the all apps button at the top of the page to get a summary listing of all of the apps. Here is a sample of some of the apps as you scroll down. Note that some say that they “sync” with QuickBooks, and some don’t, so you have to pay very close attention. 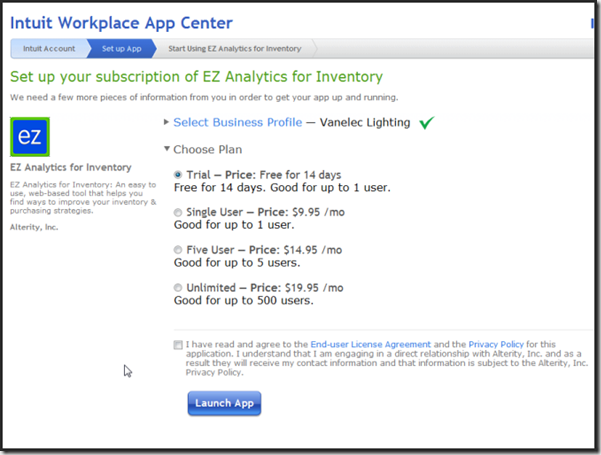 There are a lot of applications that are listed here that are general business apps that don’t have anything directly to do with QuickBooks. I find that a bit annoying, I just want to see the apps that work with my QuickBooks data. Many of the applications have a trial period, which I strongly recommend that you take advantage of before purchasing. You need to establish an Intuit Account to be able to use these apps. You might already have one – this is the same account that you would establish if you have used the QuickBooks Document Management system and other online features. There is no charge to set up your Intuit Account. If you have several company files set up (I have a lot, for testing) you will be asked to select the one to work with. You can also create a new account. Then click the launch button. Usually the next screen has you choose the plan to work with. Prices vary quite a bit from one app to another. 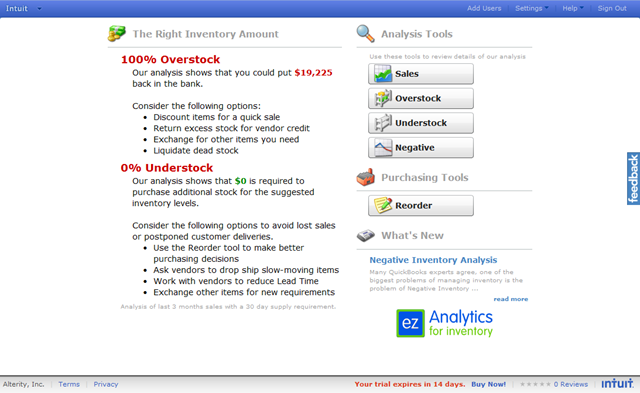 I’m using EZ Analytics for Inventory as an example (I’ll review this product in another week or so). Note that you can find the prices before you get to this point, in the the marketing web site. The next step is to decide if you want to use your own data, or use some sample data to start with. I do recommend that you test this with your own data. In many cases the test data didn’t include the kind of information I was interested in. 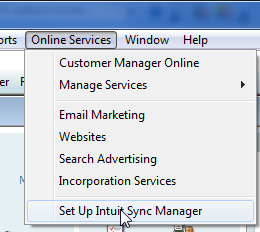 To set up the “synch” of your data, you will have to go back to QuickBooks to set up the Sync Manager. Essentially this is a program that runs on your desktop computer and periodically sends data to the Intuit web database, as well as receiving data. 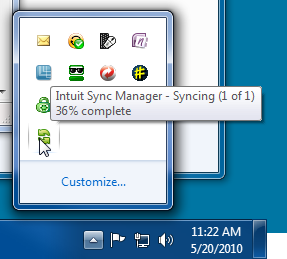 You can see more information about this in the Intuit Sync Manager Overview document provided by Intuit. Once started, if you decide that you don’t want to use this type of application you can stop the sync manager, but sometimes it takes a bit of work to get rid of. 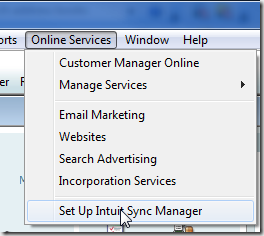 The Sync Manager is accessed via your Windows tool tray. You need to wait until the first sync is completed before you can use your app. This is a shot from a Windows 7 system, it will look different if you are using XP or Vista. Once the sync is complete you are able to run the app. This is still a new programming interface, and some aspects of it (from a programmer’s aspect) are fairly complicated to set up. 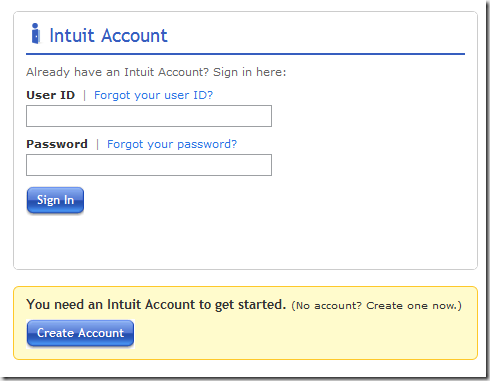 Intuit is still making adjustments and improvements, and sometimes there are some problems. While running my test for this article Intuit was rolling out an update to their base software, and the app I was using was generating some error messages. This was only an issue for a few hours, once the major update was completed everything ran fine. At this point the programming interface does not have access to all of the data in the QuickBooks database that the SDK can access. Intuit is expanding this as time goes on. 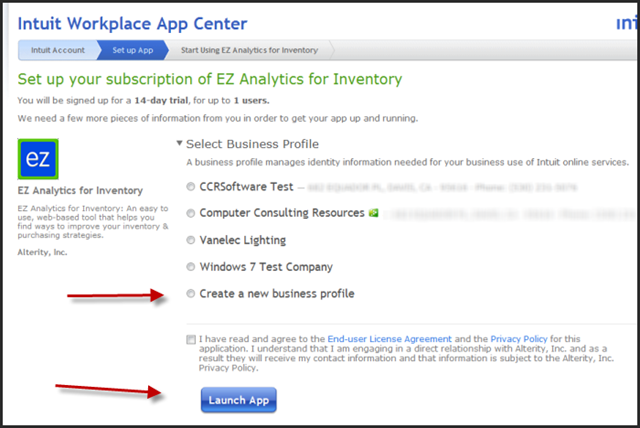 These apps will only support QuickBooks 2009 and later, and at this time only the US editions are supported. The apps only support the Windows versions of QuickBooks. Mac support is not available. QuickBooks Online isn’t supported yet (although it may be in the future). You have a very different user interface than what you have on the desktop in QuickBooks (but that is true of SDK apps as well). You must have Internet access. If the Internet is down, you cannot run your app. As this is a new interface we don’t have a long track record to see how reliable it will be. Rather than paying one time for your application you will pay per month, per user, and for some applications you may pay an additional data storage fee. You don’t have to install an app on your desktop (other than the sync manager). Setup is generally quite easy, and you don’t have to worry about installing updates. There is a lot of interest in this approach and a lot of very innovative applications are becoming available. First, I’ll admit that I’m not entirely happy with this, but that is for some personal reasons. It looks as though Intuit is “freezing” the SDK interface, and that is the programming method that I use. I hope that Intuit will see the light and will continue to develop the SDK interface along with IPP so that people who don’t want their data to be on the web have an alternative. Some people just don’t want to have their data accessible this way. I’ve seen this very strongly in the Document Management area – some people resist the online and pay-as-you-go approach, preferring to have their data kept locally and only having to pay one time for the application. However, this may be the wave of the future, with more and more of our data in the “cloud”. One concern that has been raised has been security. From an access standpoint I am not particularly worried about this being a problem. Intuit has a lot of experience with keeping data secure – how many of you use their TurboTax Online program to do your tax returns over the web? I don’t see this as a problem. I’m more concerned about the ability to make backups of your data, as I have stated before in discussions on document management. Give it a try. See if you can find something that helps your business for a reasonable fee. I’ll be reviewing some of these applications in future articles that I believe can be very useful. I am with you, I hope they keep the SDK available so that there is the choice of having applicaitons that access the local data. There are a lot of potential problems with accessing this kind of data over the Internet such as performance (slow data access), problems with synching, data being out of data because it has not been synched, etc. Those of us that have grown up with ‘on the desktop’ software applications may have a hard time adjusting, but the future of computing is fairly clear; ‘hosted applications’ and/or services via the internet is where things are heading. Users who are growing up on I-phone and now I-pad are being groomed to the new hosted technology. Intuit clearly intends to expand this capability, after all why ‘sell’ it for $149.00 when you can rent access for $15.00 per month, and obviously this approach also eliminates any unlicensed uses of software. One last note, there are a lot of great new products at the App Center already some in development (Beta trials) and some ready to go. We can only hope that this new platform gives us more tools and flexibility in how we acquire them in the future. 1) I’m not saying that the IPP kind of apps are a mistake or anything – my primary issue is that Intuit has “frozen” the desktop interface (the “SDK”) and so they apparently aren’t fixing bugs in that or keeping it up to date. The IPP interface is useful, but the SDK interface is also useful, particularly since QB is a desktop app. 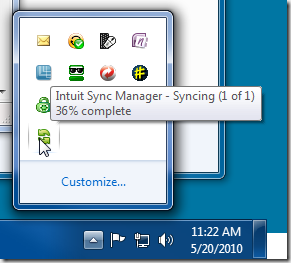 I would rather see BOTH interfaces continue to be supported by Intuit. 2) I’ll admit that I am a bit of a dinosaur – I’ve been programming since we had to use toggle switches to enter our program and then could store it on rolls of punched paper tape. I still have customers that I am supporting who are running software on MSDOS. However, I’ll note that we’ve been told by the experts that desktop computers and software are dead since the mid to late 80’s. It hasn’t happened yet. There are places for certain things, and the online apps have their place. But the desktop is far from dead. I believe the proper tools for the proper task, and as long as we are talking about a desktop version of QuickBooks then we should have desktop tools available. Web based tools are very important and useful – there are some kinds of tasks that are better supported by an online app than a desktop app. But I’m not ready to say that the desktop is dead. Intuit’s apparent abandonment of the desktop programming interface (the SDK) leaves us with some big holes that they aren’t filling properly. First, thanks for really useful article! Second – re: the “freezing the QuickBooks SDK”…we hope to soon share news with IDN members that I think will show we are not forgetting about the QuickBooks SDK developer community. Alex, we’ve been stonewalled on this for a long time. If anything comes out that says Intuit will fix the large number of SDK bugs and keep it up to date, that would be welcome news. Lots of people are not happy about this issue. We are in total agreement that the SDK needs urgent fixes so that our mutual customers can use the features they expect from our tool, the SDK and QuickBooks. SDK at this point is like a beautiful race car that falls apart when you try to drive it. please make the SDK road worthy again and keep the long term QuickBooks customers who depend on SDK data to customize their business in a way that was not possible before SDK existed. I am looking for a consultant that has experience with the apps for Wholesale/Distribution that are offered in the Intuit marketplace. I would appreciate any lead. I guess that would depend on WHICH products you are interested in, specifically.